There are 16 varieties of rattlesnakes, also known as pit vipers--a type of venomous snake having two pits under the nose to sense warm-blooded prey. There is a species in every state but Alaska and Hawaii, with the highest concentration being in the southwest. With an average lifespan over 20 years, they are not a guest you want moving in. Making your territory as uninviting as possible is key to getting rid of rattlesnakes, and keeping them away. 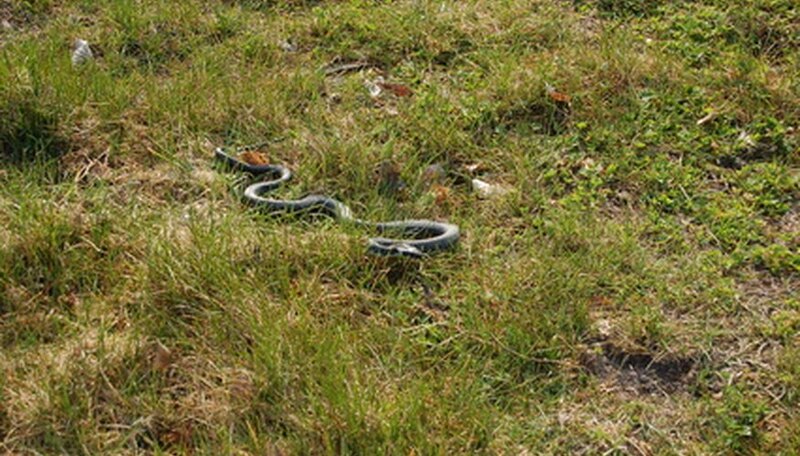 Keep lawns trimmed short, as rattlesnakes like to hide in longer grass. Remove any piles of wood, rocks or leaves that provide hiding spots for rattlesnakes, or safety for any nesting grounds. Eradicate any pest problems, such as mice or rats; rattlesnakes are attracted to easy food. Close entryways to foundations or out-buildings; this includes sealing any large cracks or holes that rattlesnakes can crawl through when seeking shelter. Nail sticky glue boards designed for catching rats to the plywood and set it in an area where you have seen rattlesnakes sunning. The rattlesnakes can be caught on the board and either killed, or released elsewhere by someone who handles poisonous snakes professionally. Place a large amount of mothballs in a cloth bag, and leave it lying where you have seen rattlesnakes; the mothballs act as a rattlesnake repellent. Rattlesnakes give birth to live young in the spring or fall. Bird feeders and compost piles can also attract rattlesnakes. Rattlesnakes can bite even when you think they are dead; handle a "dead" rattlesnake carefully.